Which Challenger Deck to Buy in 2019? 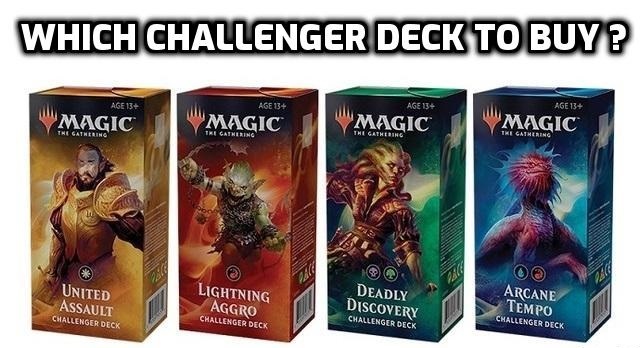 It can be hard to decide which Challenger Deck to buy in 2019. There are four different decks, each one looks powerful – so you aren’t sure which one to get. We’re here to help – together we’ll take a look at each decks gameplan and potential upgrades. This way, you’ll get a deck you enjoy the most. United Assault’s gameplan is the most straightforward. You want to cast your cheap creatures as soon as possible. This way your opponents hopefully won’t have time to react. Afterwards you use cards like Benalish Marshal or Pride of Conquerors to buff your entire team. 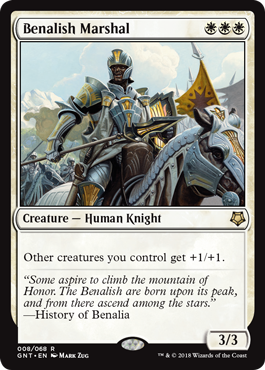 Two of the most powerful card you get in the deck are certainly Legion’s Landing and History of Benalia. Consequently, these cards are also the most expensive. 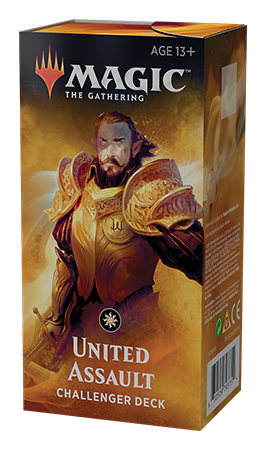 For that reason it might be a good idea to get two copies of United Assault deck. You’ll have a full playset of both best cards in the deck. And you can always trade away extra cards you get. Besides this there is one very important card you should add to your deck. 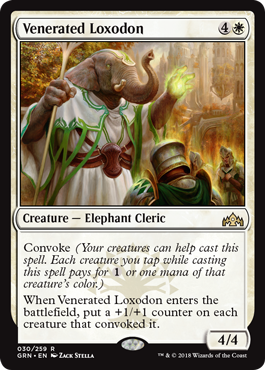 It is Venerated Loxodon. This big elephant is another way to make your creatures bigger and it often costs only one or even zero mana! How awesome is that? In order to support all these cards you should probably abandon the lifegain theme with Hawk, Leonin and Ajani’s Pridemate. Another card you might want to add is Snubhorn Sentry. While it may look weak it very quickly becomes a 3/3 for only one mana. Finally, you should probably remove Pride of Conquerors in favor of Unbreakable Formation. This spell can protect your creatures from mass removal like Kaya’s Wrath while also making them bigger and enabling some fearless attacks. Should You Buy Challenger Deck 2019: United Assault? If you like small, but powerful white creatures and if you like to win, this deck seems ideal for you. Even though there are some upgrades possible, this Challenger Deck can win without them. Furthermore if you decide to keep the lifegain theme, you should have an easier time beating aggressive decks. You can probably get it for a reasonable price on Amazon. 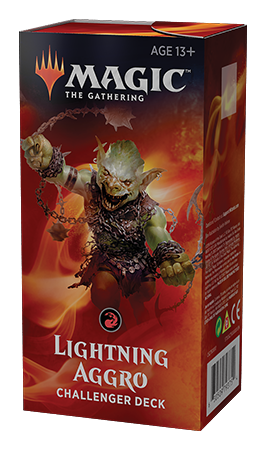 Lightning Aggro is just that – lightning fast aggressive deck. It might look similar to the white deck – they both use cheap creatures. In contrast red deck plays burn spells such as Lightining Strike and Wizard’s Lightining. Even if your opponents manage to deal with your creatures, they won’t be truly safe. 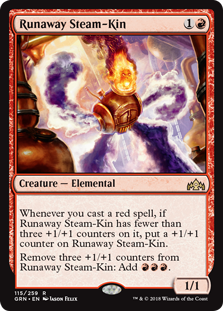 The centerpiece of the deck is Runaway Steam-Kin. It can quickly become a 4/4 for just two mana. Then it provides a nice mana boost when you need it, and starts growing again afterwards. It works especially well with Experimental Frenzy. With this two cards you can usually cast 4 cards or more from top of your library. This deck is very playable which means it won’t need many upgrades. There are however still some cards that don’t fit very well in the deck. Both Rekindling Phoenix and Banefire would work better from the sideboard. The reason for this is that they don’t have good ratio of mana spent vs amount of damage dealt. Furthermore why would you need Lava Coil? It doesn’t even go to your opponents face! You should replace those cards with a powerful draw spell Light Up the Stage. It also works well with Frenzy, removing the cards you don’t need from the top of your deck. Finally, let’s take a look at the lands. This Challenger Deck comes with 22 Mountains. This is a bit much for a deck with so many cheap spells. You should probably replace one with another Experimental Frenzy to ensure you won’t draw to many lands. Should You Buy Challenger Deck 2019: Lightning Aggro? You like to win and you like to do it quickly? If so you should definitely buy this Challenger Deck. It’s very playable out of the box and only needs small upgrades to be very competitive. Not all challenger decks are necessarily priced the same. If you’re interested in buying this one, you can check its price on Amazon. 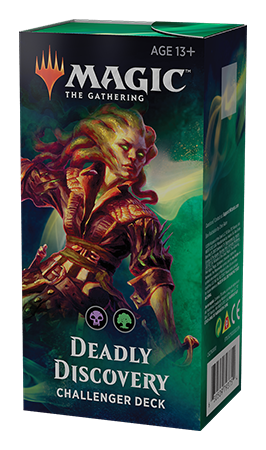 Deadly Discovery is a classic midrange deck. Therefore your plan is to get as much value as possible from your cards. You are slower than an aggro decks but faster than control and you can get a fair matchup against any deck. Furthermore you can really customize your deck with very versatile sideboard. Jadelight Ranger, Merfolk Branchwalker and Seeker’ Squire help you get lands consistently. Meanwhile Wildgrowth Walker stops aggro decks with both lifegain and a big body. You can remove your opponents creatures with Ravenous Chupacabra, Vraska, Relic Seeker or Eldest Reborn. This powerful enchantment also enables nice combos with Golgari Findbroker. The last part of the saga brings back Findbroker, which can return the same saga to your hand immediately. Lastly, Find // Finality is an important card. It can deal with your opponents creatures or getting a couple of yours back. Either way, your opponents won’t be happy when you cast it. Firstly, you should upgrade your manabase. As a result you’ll be able to cast your cards more consistently. You want to add two copies of Woodland Cemetery and three Overgrown Tombs. Afterwards you can remove all guildgates and a basic land. Green-black decks have plenty of strong options. Therefore it’s difficult to say exactly which cards to add to your list. However if you decide to add just one card to the deck it should definitely be Vivien Reid. 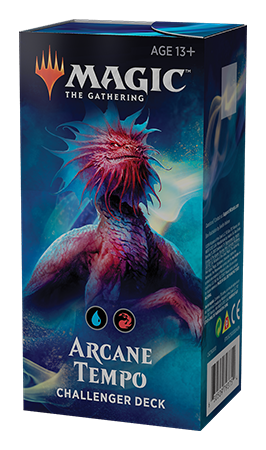 This five mana planeswalker deals with a lot of problematic permanents and also provides steady course of card advantage. Likewise both Vraska, Golgari Queen and an additional Vraska, Relic Seeker might be a consideration. If you want to beat control, you should probably also a Carnage Tyrant or two. Another option you have is to add blue to your deck – although it’s quite expensive, you’d have one of the best decks in Standard. What do you get for adding blue? 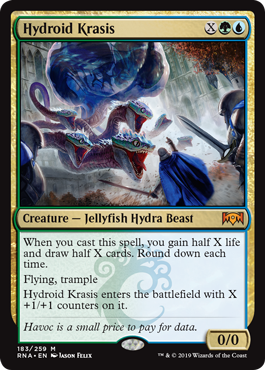 Well, a couple of very strong creatures – Hydroid Krasis and Hostage Taker. Krasis is the main reason for adding blue, so you want 4 copies of them, while you only want a couple of Hostage Takers. You also get a benefit of adding some counter-magic to your sideboard in form of Disdainful Stroke and Negate. Should You Buy Challenger Deck 2019: Deadly Discovery? Short answer – no, you probably shouldn’t. Green-black midrange deck is a thing of the past. Nowadays everybody has moved to more powerful blue-black-green, with Hydroid Krasis. As previously stated, if you want to play this version of the deck, you will have to invest more money for other expensive cards. On the other hand if you enjoy this type of deck and you don’t mind playing with slightly less optimized green-black version, it’s still an okay buy. You can check its price on Amazon. As you can see this deck is all about casting instant and sorcery spells, while your creatures make full use of them. Your Crackling Drakes can grow very quickly and even if your opponent deals with them, you already got your card back. While this deck has plenty of good cards it still lacks a little bit of focus. What is one Arclight Phoenix even doing in the deck? Your either want four of them or zero. This gives you two different directions to go with your upgrades. Cheaper one without Phoenix and more expensive one with four of them. If you want this version deck to be successful, you need 3 more Phoenixes. The only other creatures you’ll want to keep in the deck are Goblin Electromancer and Crackling Drake. Due to fact you want to have a lot of sorcery and instant spells, you can’t afford to run too many creatures. Niv-Mizzet and Mystics will have to move to the sideboard. With only twelve creatures, Dive Down isn’t that strong anymore and you should just cut it from the deck. Discovery // Dispersal is a perfect card to replace it. 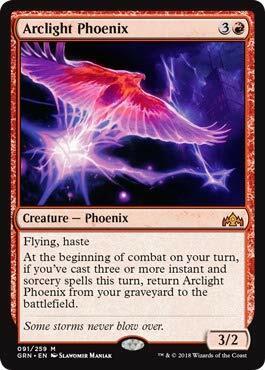 The deck is still very good and might even be better than the Phoenix version. You can remove Phoenix and either trade it or sell it. As of April 2019, his value was a bit over $20. This will come in handy when you’ll be upgrading your challenger deck. You will want to change your creatures in this version. Every creature in your decks should be very focused on attacking through the air. You wont be trying to cast a lot of spells in one turn to get back your Phoenixes, so Goblin Electromancer won’t be needed. Instead you will add two powerful flyers. You might also want to try to fit in some number of Discovery // Dispersal since it’s a very useful card in this type of deck. 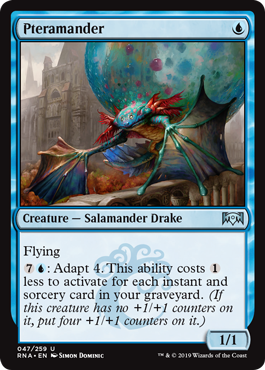 Furthermore one copy of Maximize Velocity might come in handy to get a victory out of nowhere with your big drakes. Last, but definitely not least, you should upgrade your manabase – and this goes for both versions of the deck. 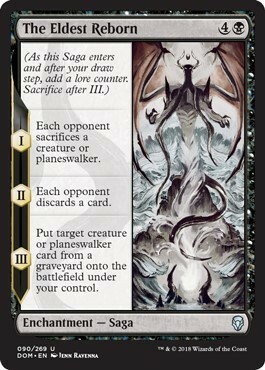 You should replace the guildgates with Steam Vents and one basic land with a fourth copy of Sulfur Falls. Should You Buy Challenger Deck 2019: Arcane Tempo? The deck has probably the most valuable cards from all the Challenger Decks 2019. That’s why it’s usually pricier than other three decks. For example the three Sulfur Falls you get are a staple card in Modern. That means that even after rotation this cards will still have value. If you want to, you can grab this cool deck on Amazon. When deciding which Challenger Deck to buy on 2019, you should really just pick whichever deck you like the most. If you just want to win, we’d recommend either United Assault or Lightning Aggro. If you want to win with style, Arcane Tempo is the way to go. Arcane Tempo also has the most long-term value since some of its cards are Modern playable. However if the best thing for you is getting value in each play you make, you won’t mind a bit weaker Deadly Discovery. Check the whole package deal! Most importantly, whichever deck you decide to pick, have fun with it. 🙂 The decks are also pretty balanced against each other. This means you could get all four of them, and have them as a perfect MTG game for up to four players. If you don’t want to mess anything up when upgrading your new deck, check our guide on How to Build Better Decks. Don’t forget to check our Instagram or Facebook page, so you won’t miss the newest articles about Magic the Gathering and how to get better at it. Oh, and our Instagram also has plenty of MTG memes, to brighten your day. 🙂 If you have anymore questions, don’t be afraid to reach out, we’re happy to help. Hopefully this article helped you decide which Challenger Deck to buy in 2019. Have fun and may you achieve a lot of victories with it.